The Dub Pistols are incredibly honoured to have been nominated for THREE awards at this year’s Bass Music Awards. The band are in the running for best live performance, ‘Return of the Pistoleros’ has been put forward for best album, whilst founder and frontman Barry Ashworth has been nominated for the prestigious lifetime achievement award. Head over to the store now. Pre-Order ‘The Return of The Pistoleros’ Album NOW! Festival season is fast approaching, so what better time to welcome back the perfect soundtrack to a mucky weekend? 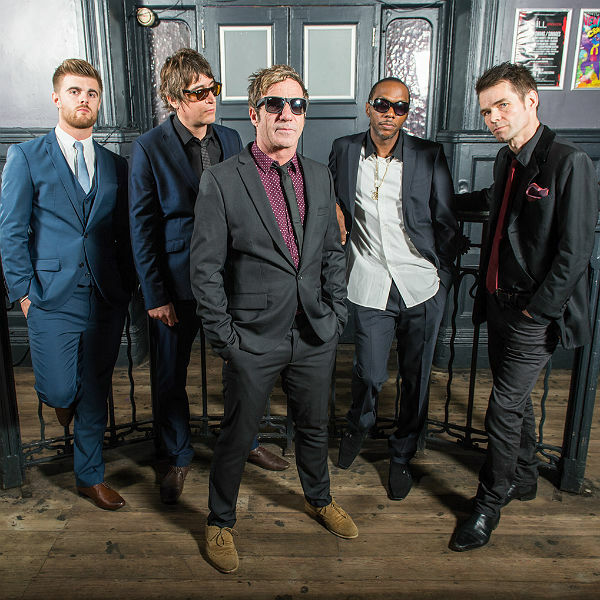 Ladies and gentleman, make way for Dub Pistols – The Return of The Pistoleros! The album is out on Sunday Best Records on June 1st. Pre order now! Back out on the road to promote the April Release of their new Album ‘Return of The Pistoleros’ founding member Barry Ashworth brings his band of sharpshooters to blow you away with their fusion of dub, breaks, jungle and hip hop. Famed for their snappy suits, intoxicating rhythms and catchy hooks these guys are amongst the best in their trade. Regularly appearing across the world for nearly 20 years, and firm favourites at festivals including Bestival, Glastonbury and Beat Herder, we are pleased to welcome them to the fitting surroundings of The Factory for a night of high jinx and high quality tailoring – these guys never fail to disappoint. They’re back! Although they’ve never really been away. Barry Ashworth’s evergreen bunch of dubwise vagabonds have been rocking practically every festival in existence all summer, and yet have still found time to squeeze out a new album — their sixth. And it’s another corker. ‘The Return Of The Pistoleros’ makes them sound like a Latin prison gang, extras in a spaghetti western, a marauding mob of Tequila-swigging mobsters, or a Mexican drug cartel. Some of which have a grain of truth to them. Joking aside, though, it’s been a long road to get to where they are — one of the most popular and best-loved acts on the circuit — but it’s testimony to their perseverance and staying power that their popularity still keeps increasing. The Dubs have been dubbed ‘The Pistoleros’ in recent times by their army of fans — so it seemed only natural to adopt the tag for their latest album on Rob Da Bank’s Sunday Best imprint. El Pistolero is also the nickname of Uruguay talisman Luiz Suarez, who knocked England out of the 2014 World Cup. But as Barry is a Liverpool fan, he’s happy to still have this association. Just. The Dubs toured with Neville Staple from The Specials at the start of 2014, and this led to the toaster guesting on ‘Real Gangster’ on the new ‘Pistoleros’ album. On the album, ‘Our Life’ is a free-spirited dub cut featuring long-term Dubs vocalists Lindy Layton and TK Lawrence. Languid beats song ‘Say Goodbye’ features the deep jazzual tones of Ashley Slater, ‘Report’ showcases major new hip-hop talent Genesis Elijah freeflowing over some lilting Dan Bowskill verses, and ‘Kill Your Sound’ has great reggae vocalist Seanie Tee all over it. ‘Roll & Come In’ sees the legendary Earl 16 (Leftfield etc) return to add sweet words to this spacious dub cut, and regular MC Darrison guests on dubwise drum & bass party track ‘Ride With It’. And there’s plenty more where that came from — it is, indeed, another corker. Like their incendiary live shows, this new long-player is a riotous mix of dub, drum & bass, hip-hop, punk and ska. They’ll be heading out on tour this autumn in support of the new ‘Pistoleros’ release, so watch out! The gun-slinging outlaws are back in town — and this time, they’re swigging Tequila. The Dub Pistols coalesced in the mid-’90s and initially surfed the big beat wave along with acts like the Chemical Brothers and Fatboy Slim. They had some minor chart hits like ‘Cyclone’ and ‘There’s Gonna Be A Riot’ on Concrete Records, remixed the likes of Moby and Limp Bizkit, and made dramatic inroads into America. Their debut album in 1998, ‘Point Blank’, cemented their position as party-rockers extraordinaire, and by the time it came to their second album around the Millennium — ‘Six Million Ways To Live’, with guest vocals by reggae great Horace Andy and lead singer of The Specials, Terry Hall — they were more concerned with some of the world’s problems. As the noughties progressed, they signed to Sunday Best and went a bit more poppy for ‘Speakers & Tweeters’, which included cover versions of ‘Rapture’ by Blondie, ‘Peaches’ by The Stranglers and ‘Gangsters’ by The Specials – a track they had been making their own live. After guesting on their second album with ‘Problem Is’, estranged Specials singer Terry Hall started singing live with them, and the warm reaction he received from music fans was instrumental in him agreeing to reform his infamous 2-Tone band a few years later. Next Dubs album ‘Rum & Coke’, so named after some infamous recording sessions in Barbados, introduced more guest vocalists such as former Freak Power man Ashley Slater and Beats International gal Lindy Layton, and with last long-player ‘Worshipping The Dollar’ in 2012 they consolidated their position as one of the foremost festival-rockers in Europe.